After a hard day of swimming, Yoga, and Christmas shopping, nothing beats coming home and cleaning out the garage. Nothing, that is, except eating the best roast pork loin in the history of heat and pork once you're finished! 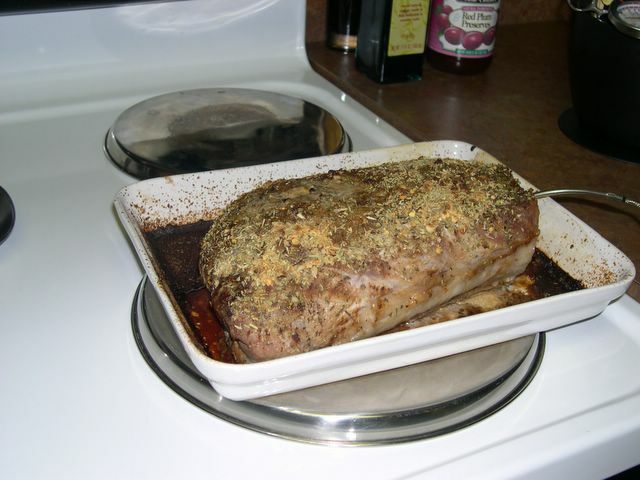 Just in case you're wondering, I rubbed it with vinegar, then rubbed it with garlic, injected it with a marinate of my own design, and "crusted" it with cinammon, red pepper, black pepper, kosher salt, and rosemary. I may be exaggerating a bit, but I must say ummmm, ummm. Also involving things that are white and mammalian: On the great news front, Marissa is doing better, and is home from the "IV Ordeal" at Centennial hospital (for all of my Roman friends, that's "IV" as in "intravenous", not "4 Ordeal", which might also be interesting, but I don't have a story for that. She and baby Jackson are doing well, and that's what matters. Further updates may appear on "The Wayward Hatch".